There is also an option in the Legacy Statistics to create a graph. I include place details, such as cemeteries, in my place names, which is why the Necropolis Springvale and Fawkner Crematorium appear in my top 9 locations. Since I include Place Details in my Location field, I wanted to see what the results would be if I removed those place details. To do this, I ran a Location Report in Legacy, copied the report to Microsoft Excel, and then manipulated the data in the report to generate a new location list. By merging this way, I now had only 2225 unique locations. In comparing the two sets of statistics, I’m not sure manipulating the data in Excel was worth the time it took. 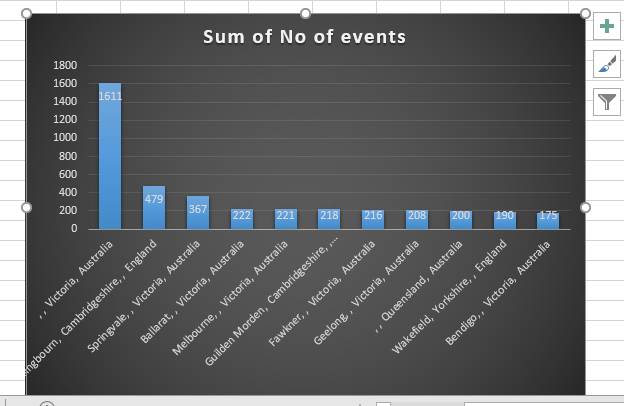 The Legacy statistics lists the number of events the location is linked to, while the Location Report creates a summary on the number of individuals the location is linked to, so there is a discrepancy between the two.